The total lunar eclipse of 21 January 2019 is visible in its entirety from the Americas, Greenland, Iceland, Norway, Portugal, the British Isles and far Western Europe. This looping animation shows the eclipse’s progress from 03:30—07:00 UT at fifteen-minute intervals. Celestial north is up and east is left. See further down the page for an infographic showing the various stages of the eclipse with precise timings. AN animation by Ade Ashford. 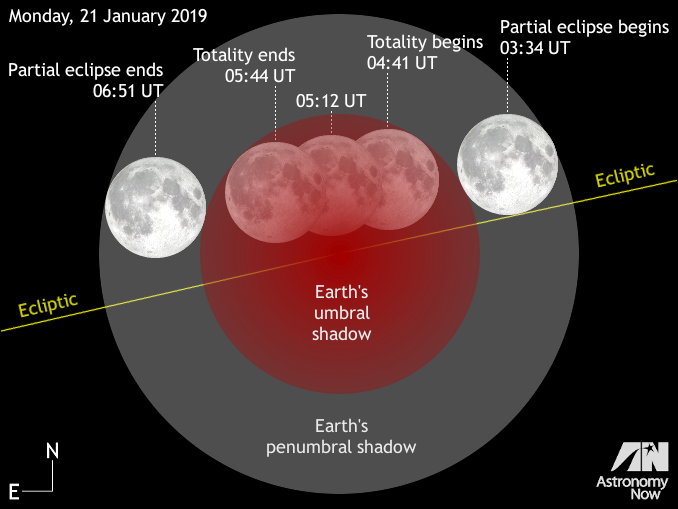 If skies remain clear for around 3½ hours starting 03:30 UT (3:30am GMT) on 21 January, observers located on the lunar-facing hemisphere of Earth can witness the key stages of one of nature’s glorious spectacles – a total lunar eclipse. And the best part is that you need no specialist equipment to enjoy it, just the naked eye. What’s more, this month’s full Moon occurs just 14¾ hours before lunar perigee, when the Moon passes closest to Earth in its orbit. Hence this full Moon will appear somewhat larger than normal, which by one definition makes it a supermoon. At the instant of perigee – 7:59pm GMT on 21 January – the Moon lies 357,344 kilometres distant and has an apparent size of 33.4 arcminutes, which is about 7½ percent larger than an average full Moon. What causes a total lunar eclipse? A total lunar eclipse occurs when the full Moon is completely immersed in the darkest portion of Earth’s shadow known as the umbra. The interval during which the Moon is fully immersed in the umbra is known as totality. The lunar orbit is tilted to that of Earth by a small angle, which is why a lunar eclipse doesn’t occur at every full Moon. However, if the points where the orbital planes of the Moon and Earth cross (known as the nodes) line up with the Sun at full Moon, then we experience a lunar eclipse. This is frequently preceded or followed by a solar eclipse (when the Moon passes in front of the Sun), as witnessed from northeastern Asia, North Pacific Ocean and some of Alaska on 6 January. Since we only see the Moon due to the sunlight that it reflects back to us, you might reasonably assume that it would fade away for the duration of totality (63 minutes for this event). That would indeed be true if Earth was devoid of an atmosphere, but the shell of air surrounding our planet acts as a weak lens, bending a portion of reddened light from all the sunrises and sunsets circling the globe onto the face of the Moon, lending it a coppery-red hue. The key stages of the total lunar eclipse of 21 January 2019. 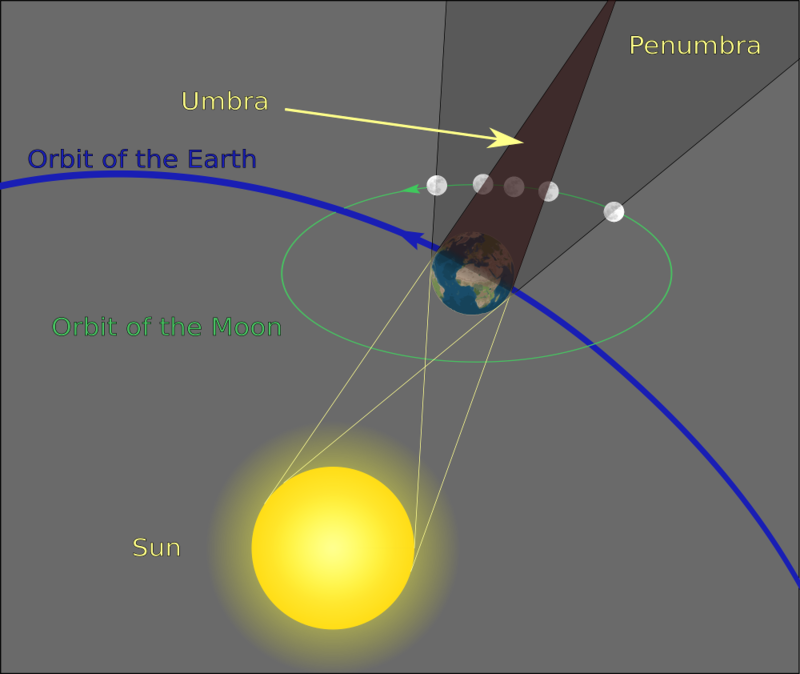 Note that the Moon passes through the northern part of Earth’s umbral shadow, hence the southern lunar limb will appear darkest during totality. AN graphic by Ade Ashford. While you may not relish the prospect of waking up in the small hours most Monday mornings, observers in the British Isles and Western Europe will hopefully be more inclined to set an early alarm on 21 January. In the UK, if your house affords a view due west then you may not need to brave freezing temperatures by watching the eclipse indoors through a window! 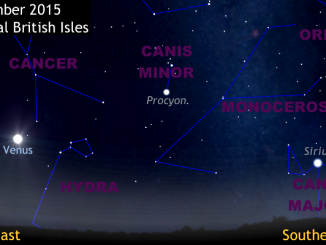 As seen from the British Isles, partial eclipse begins at 3:34am GMT. Totality begins at 4:41am GMT and mid-eclipse occurs 31 minutes later (5:12am GMT) when the Moon lies 26° above the western horizon for an observer in the heart of the UK. Totality ends at 5:44am GMT and partial eclipse ends 67 minutes later, just as the first light of nautical dawn appears in the east-southeast. Observers in North and South America have pretty much a ringside seat to view all of this lunar eclipse that straddles the night of 20–21 January. The Moon lies on the meridian and highest in the sky at mid-eclipse for longitude 75° West, hence both the American and Canadian capitals are almost perfectly sited – as, indeed, is the Eastern Seaboard of North America. South America is similarly well placed. For observers on the East Coast of the United States, the fun begins on Sunday night when partial eclipse begins at 10:34pm EST. Totality begins at 11:41pm EST, mid-eclipse occurs at 12:12am EST Monday morning (the Moon’s altitude being 71° in Washington, D.C. and 65° in Ottawa, ON) and totality ends at 12:44am EST. Here, partial eclipse ends at 1:51am EST on 21 January. For observers on the West Coast of the United States, the event is confined to the evening of Sunday, 20 January. Partial eclipse begins at 7:34pm PST and totality begins at 8:41pm PST. 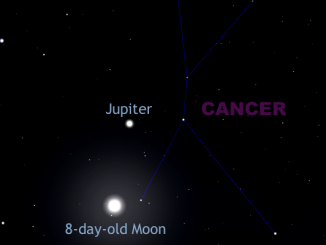 Mid-eclipse occurs at 9:12pm PST when the Moon is 49° high in the eastern sky as seen from Los Angeles, CA. Here, totality ends at 9:44pm PST and partial eclipse ends at 10:51pm PST. If you happen to be on the opposite side of the Earth to where the action’s taking place, you’re clouded out or you just can’t prise yourself from your warm bed, you can still view the event online. The Virtual Telescope Project starts streaming via YouTube at 03:30 UT on 21 January. When can I see the next lunar eclipse? A partial lunar eclipse occurs on 16 July 2019. As seen from the British Isles, the Moon rises in the southeast at sunset already partially immersed in the umbra, which continues until midnight (23h UT). But in order to see the next total lunar eclipse we have to wait until 26 May 2021 when observers in Oceania get the best views. 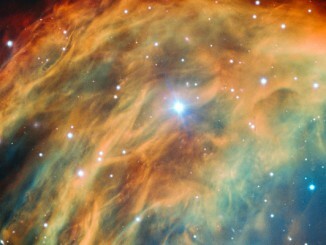 Astronomers using ESO’s Very Large Telescope in Chile have captured the most detailed image ever taken of the Medusa Nebula in the constellation of Gemini. As the star at the heart of this nebula made its transition into retirement, it shed its outer layers into space, forming this colourful cloud.